Two of the biggest concerns that enterprise clients have with traditional brick and mortar data centers is that they take a lot of time and money to build. These are two of the main reasons that modular data centers have become such an attractive alternative, especially for mid-sized enterprises. Let’s take a closer look at some of the specific benefits. The cost of cloud computing, increasing data demands, and distributed environments have created the need for a scalable and more flexible data center solution: the modular data center. A modular data center draws on the best ideas for design, reliability, and efficiency and then packages an optimized solution into a prefabricated modular design. This allows MSEs to easily grow and expand operations in the right place, at the right time, and with the right impact needed to meet evolving demands and new technologies. Private Cloud Enablement – Shared information across your Bus can be brought home with our Edge solutions. Get all the benefits of public cloud in a secure on-premises deployment. Scalability – Prefabricated units deliver a more flexible approach to data center construction. A repeatable, standardized design allows a client to buy the solution that meets its exact requirements today, then easily and quickly scale up as needs change. Agility – In order to survive and thrive, companies need agility so they can take advantage of changes in their industry and new technology. Modular data centers empower businesses to respond to these changes rapidly. Space Efficiency – The designs of modular data centers are optimized, giving them a compact footprint. That gives the client flexibility in delivery and placement of the facility. Energy Efficiency – The modular approach incorporates only the hardware needed for the present, which can then be expanded or upgraded later. Components can be selected for their energy efficiency, and internal subsystems may be tightly integrated, resulting in further gains. Less Cooling – Almost half of the energy consumed by data centers is used to cool servers. Because of their optimized performance, modular data centers typically require less cooling. Higher Quality – Since modular data centers are manufactured in a controlled environment, quality checks can be performed at the factory, before the unit is delivered to the installation site. Built-in Expertise – We have created innovative data center technology since 2008 when we invented the first software defined data center. Our design, build, delivery, installation, and support ensure your modular data center fulfills the needs of today’s applications and supports innovation into the future. Cost Savings – All of the previous benefits add up to the biggest advantage of all: cost savings. Modular data centers can cut long-term operational, expansion, and maintenance costs. Mid-Sized Enterprises can realize many benefits from modular data centers like the BASELAYER EDGE X2. The X2 is designed for Tier 3 data center deployments. It has a compact footprint of just 227 square feet and is outdoor-rated for deployment anywhere. 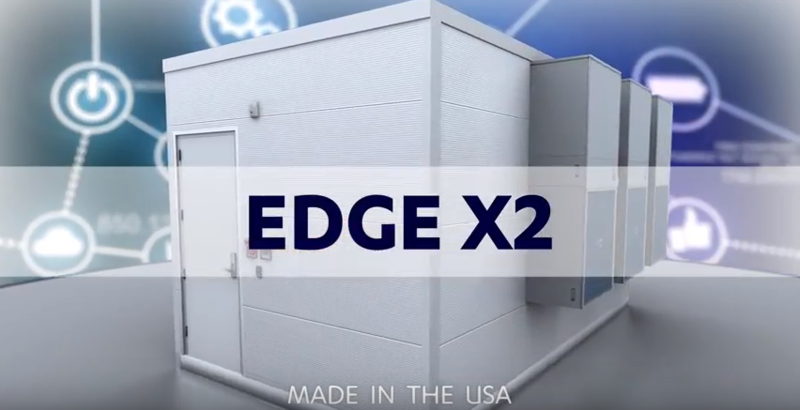 To learn more about the new EDGE X2 Modular Data Center, watch the EDGE X2 Product Reveal video.